What is Free Cash Flow to Equity (FCFE)? Free cash flow to equity (FCFE) is the amount of cash a business generates that is available to be potentially distributed to shareholdersStockholders EquityStockholders Equity (also known as Shareholders Equity) is an account on a company's balance sheet that consists of share capital plus retained earnings. It also represents the residual value of assets minus liabilities. By rearranging the original accounting equation, we get Stockholders Equity = Assets – Liabilities. It is calculated as Cash from Operations less Capital ExpendituresCapital ExpenditureA Capital Expenditure (Capex for short) is the payment with either cash or credit to purchase goods or services that are capitalized on the balance sheet. Put another way, it is an expenditure that is capitalized (i.e. not expensed directly on the income statement) and is considered an "investment". Analysts view Capex. This guide will provide a detailed explanation of why it’s important and how to calculate it and several examples. Let’s look at how to calculate Free Cash Flow to Equity (FCFE) by examining the formula. It can easily be derived from a company’s Statement of Cash FlowsStatement of Cash FlowsThe Statement of Cash Flows is one of the 3 key financial statements that reports the cash generated and spent during a specific time period, it acts as a bridge between the income statement and balance sheet. 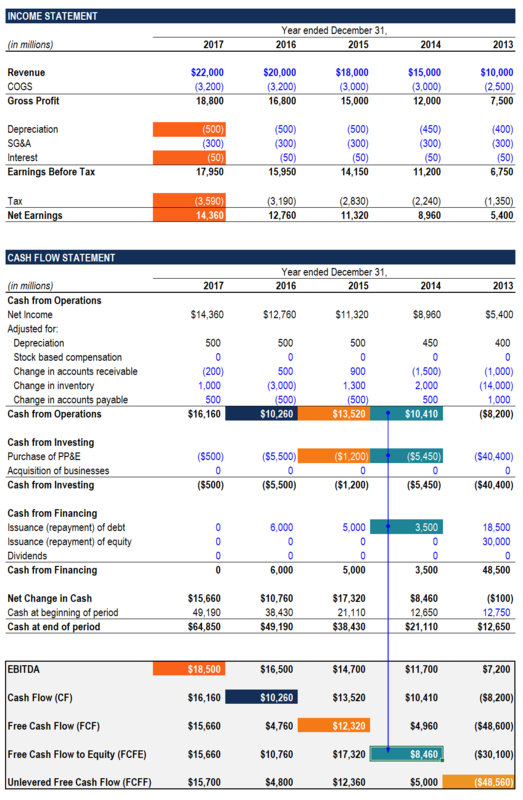 Below is a screenshot of Amazon’s 2016 annual report and statement of cash flows, which can be used to calculate free cash flow to equity for years 2014 – 2016. Let’s look at an Excel spreadsheet a financial analyst would use to perform an FCFE analysis for a company. As you can see in the figures below, the company has a clearly laid out Statement of Cash Flows, which includes three sections: Operations, Investments, and Financing. In 2018, the company reported cash from operations of $23,350 million, spent $500 million on purchasing property, plant, and equipment (PP&E)PP&E (Property, Plant and Equipment)PP&E (Property, Plant, and Equipment) is one of the core non-current assets found on the balance sheet. PP&E is impacted by Capex, Depreciation and Acquisitions/Dispositions of fixed assets. These assets play a key part in the financial planning and analysis of a company’s operations and future expenditures and issued no new debt, which results in an FCFE of $22,850 million. In 2014, the numbers tell a very different story, the company reported cash from operations of -$5,490 million, spent $40,400 million on purchasing property, plant, and equipment (PP&E) and issued $18,500 million of debt, which results in an FCFE of -$27,390 million. As you can see, in one year the company posted very positive FCFE and in another year, it was very negative, even though operating activities weren’t as dissimilar. The reason for this was the significant investment that was made in purchasing additional PP&E. Since equity investors must fund the purchase of such assets, the Free Cash Flow to Equity figure must account for this. FCFF stands for Free Cash Flow to the Firm and represents that cash flow that’s available to all investors in the business (both debt and equity). The only real difference between the two is interest expense and their impact on taxes. Assuming a company has some debt, its FCFF will be higher than FCFE by the after-tax cost of debt amount. To learn more about FCFF and how to calculate it, read CFI’s Ultimate Cash Flow GuideThe Ultimate Cash Flow Guide (EBITDA, CF, FCF, FCFE, FCFF)This is the ultimate Cash Flow Guide to understand the differences between EBITDA, Cash Flow from Operations (CF), Free Cash Flow (FCF), Unlevered Free Cash Flow or Free Cash Flow to Firm (FCFF). Learn the formula to calculate each and derive them from an income statement, balance sheet or statement of cash flows. When valuing a company, it’s important to distinguish between the Enterprise ValueEnterprise ValueEnterprise Value, or Firm Value, is the entire value of a firm equal to its equity value, plus net debt, plus any minority interest, used in valuation. It looks at the entire market value rather than just the equity value, so all ownership interests and asset claims from both debt and equity are included. and Equity ValueEquity ValueEquity value, commonly referred to as the market value of equity or market capitalization, can be defined as the total value of the company that is attributable to shareholders. To calculate equity value follow the examples and step-by-step instruction in this straightforward guide from CFI.. The Enterprise Value is the value of the entire business without taking its capital structure into account. Equity Value is the value attributable to shareholders, which includes any excess cash and exclude all debt and financial obligations. The type of value you’re trying to arrive at will determine which cash flow metric you should use. Use FCFE to calculate the net present value (NPV) of equity. 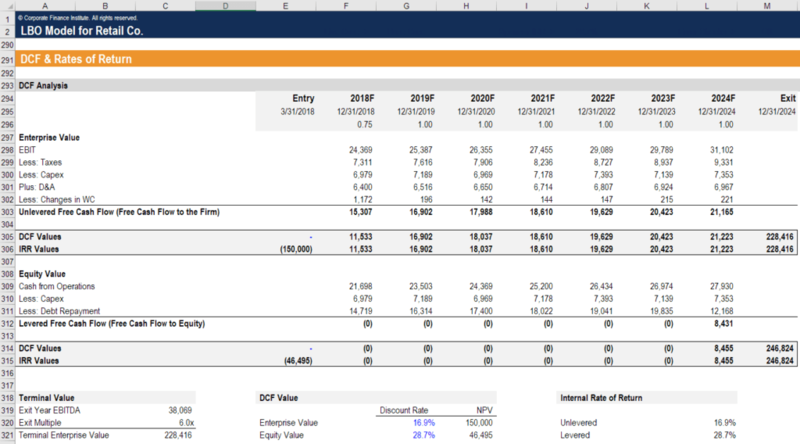 Use FCFF to calculate the net present value (NPV) of the enterprise. As you can see in the image above from CFI’s LBO Financial Modeling Course, an analyst can build a schedule for both Firm-wide and Equity-only cash flows.